"The convergence of finance and technology has changed the global banking landscape in unprecedented ways. Thus, it’s more critical than ever for financial service leaders to stay ahead of this constantly changing environment." 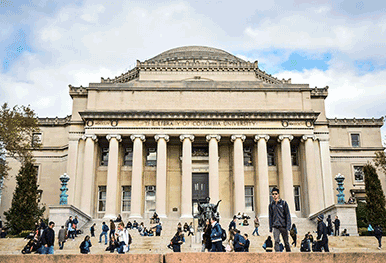 Program Partner: Eruditus Executive Education is the program partner for Columbia Business School’s Global Banking Program. Prospective participants with questions on the program are encouraged to contact them for further information by email at gbp_columbia@eruditus.com or phone at +91 22-61623112 (India) or +971 44302011 (Dubai) or +65 68714030 (Singapore). For more detailed program information, download the brochure. Suresh Sundaresan is the Chase Manhattan Bank Foundation Professor of Financial Institutions at Columbia University. He has worked as a senior strategist at Lehman Brothers in their Fixed Income Division during 1986-1987 and he has consulted full time for Morgan Stanley Asset Management during 2000-2001. His consulting work focuses on term structure models, swap pricing models, credit risk models, valuation, and risk management. He has conducted training programs for leading investment banks including, Goldman Sachs, Morgan Stanley, CSFB and Lehman Brothers. He has served on the Treasury Bond Markets Advisory Committee. He was the resident scholar at the Federal Reserve Bank of New York during 2006 and he has testified before the United States Congress on the transparency of Corporate Bond Markets. Admitted participants will have to pay ten percent of the fee within ten days of their admission to confirm their seat. Please note that if a candidate is admitted and accepts the admission, the application fee is adjusted with the program fee payable. For information on the application deadline and fees, please visit the program's Eruditus page or contact gbp_columbia@eruditus.com.